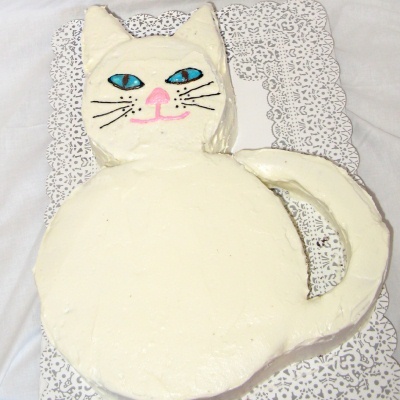 This pretty kitty cake with blue eyes was perfect for a 13 year old who requested a chocolate cake, strawberry filling, white frosting ... and something involving cats. Three chocolate cakes in small, medium and large were baked. The cakes were torted. Torted means splitting the cake layer horizontally in half which adds extra height to the cake, giving a place to add fillings for a special look and taste. The cake domes were cut off to give it a flat surface. The ears out of the smallest cake. The medium sized cake was used to make the head. The cakes were cut by hand, and done in such a way that a tail was also made. A creative idea...a frosting dam was put on the body and head of the cat to hold in any strawberry juice. The ears and tail remained strawberry-free. A final layer of frosting and cute cat face was designed! 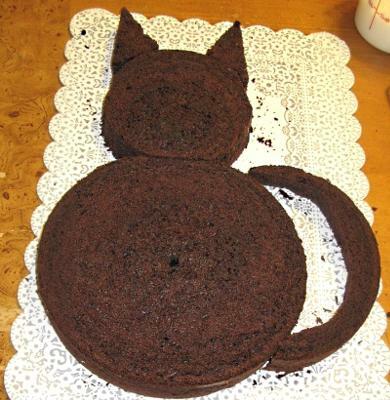 Special thanks to Kimberly for allowing use of he wonderful cat cake pictures! 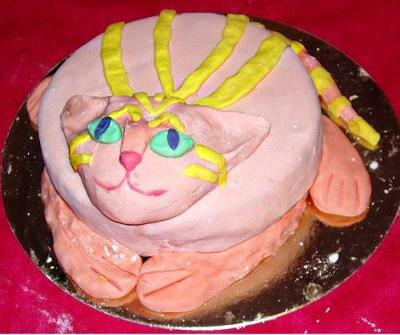 This round cat cake is a sweet one in pink! Using a round cake for the body, fondant is shaped to create the details. Green eyes, yellow stripes and a pink nose make this a really cute cat. 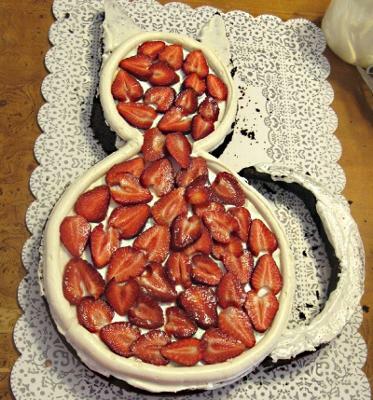 Paws were added on either side of the cake and a tail curling around the cake artfully. Thank you Noa for giving Perfect Parties permission to use your cake idea!